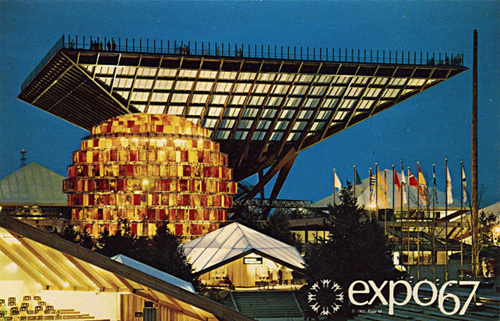 Expo Lounge is a fun mine of architecture & design from Expo 67 and its general 1960s context – the utopian architecture, the futurist and sci-fi imagination, and the burst of innovation and optimism . Below is a near random collection of the material on the site, but it’s worth going and seeing for yourself. 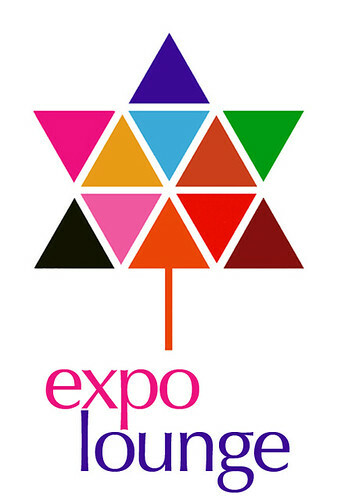 Below, an artist’s conception of the African pavilion and the Expo logo. Katimavik, the Canadian pavilion in the shape of an inverted pyramid (and accidentally inspired by a pyramidal ashtray in the architect’s office). 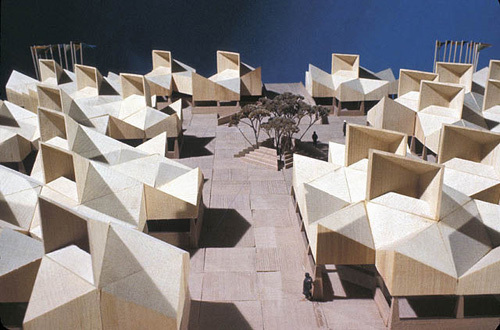 Oddly I can’t find any mention of Moshe Safdie’s modular Habitat complex, but there’s a good post on the equally well-known geodesic dome, the US pavilion. Also see La Ronde, one of the most popular areas of the Expo site. 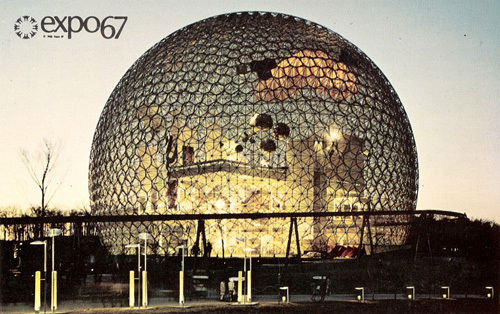 And it seems there’s a proposal to launch Expo 17 in Montreal – 50 years later. This entry was posted on Sunday, March 28th, 2010 at 1:48 pm	and is filed under architecture, Canadian design, design. You can follow any responses to this entry through the RSS 2.0 feed. You can leave a response, or trackback from your own site.